Galway United players confront the referee after the goal. THE GREATEST LEAGUE in the world strikes again. Cabinteely met Galway United in the SSE Airtricity League First Division at Stradbrook yesterday, and the game produced a bizarre goal late on. Galway keeper Tadhg Ryan was penalised for picking the ball up a second time and Cabinteely pounced quickly to score from an indirect free-kick in the 89th minute. The Galway stopper appeared to be adjusting his boots and seemed unaware of the decision until the ball was squared across to substitute Keith Dalton, who passed it into an empty net. It proved to be nothing more than a consolation, however, as Galway took three points thanks to first-half goals from Robbie Williams and Marc Ludden, despite Cabinteely being on top for most of the match. 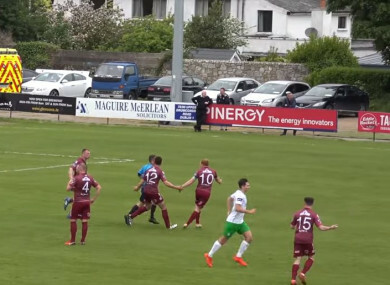 Email “Watch: Cabinteely score utterly bizarre goal against Galway United”. Feedback on “Watch: Cabinteely score utterly bizarre goal against Galway United”.